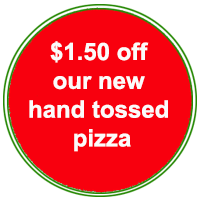 Try Our New Hand Tossed Pizzas! Please Note: No allergen information on our website or menu should ever be considered a guarantee, but simply a best faith effort to serve our customers. We have taken all of the normal precautions to avoid cross-contact, (e.g. hand washing prior to preparing your food, a clean preparation area, clean utensils, etc.) however, we cannot totally eliminate the possibility of incidental gluten contact. Please consider this virtually unavoidable risk in advance of placing your order if trace amounts of flour would cause you health issues. No allergen or nutriional information on our website or menu should ever be considered a guarantee, but simply a best faith effort to serve our customers. We have no items containg peanuts or shellfish in our restaurants. All of the other "big 8" and gluten are present in the facility in one form or another. We ask that when placing your order your alert the manager on duty to your food allergy or sensitivity. We will then try our best to avoid any accidental cross-contact, but again, we can offer no guarantees and accept no liability. The more information relating to your specific needs you can provide, the better we can attempt to protect you. The range of tolerance or reactions to the present of food allergens varies greatly from person to person. Decisions on the amount of precautions you should take or risks you may expose yourself to are always best made by you in consultation with your physician. 10 a.m - 9:30 p.m.